Most likely, the past few months have been pretty hectic for you, trying to get the product right, figure out your MVP and go-to-market with all the things you've spent so much time on. However, don't forget to put your customers on top of mind and build a lasting relationship with them. Using a CRM system can help you see everything in one place and make your job ever easier. It's often said that your sales and marketing process should be established as soon as you have your product being built. The buyer's journey is a crucial discovery process for any business. Identifying who your buyer personas are and how you can map their journey to touch points will enable selling with context therefore increasing your conversions. CRM system can help you manage your startup business better. Here are some things for you to know before picking up a new CRM system for your startup business. A business thrives because of one thing, it's strong relationship with its clients or customers. Don't wait till they start paying their invoices but begin the relationship building even before sign up. If you are a SaaS business, here are some tips that might help. As soon as you're on the phone to a prospect it's time to start helping and supporting them in their buying journey. Sales for most businesses breathes revenue into a pipeline and managing this process is key to being profitable and generate more revenue and prevent churn. To do this well, it's important to track how the CRM maps to a sales process. An auto-message can be sent out with the integration of a CRM to your sales tools, helping you use automation to do make your job easier. 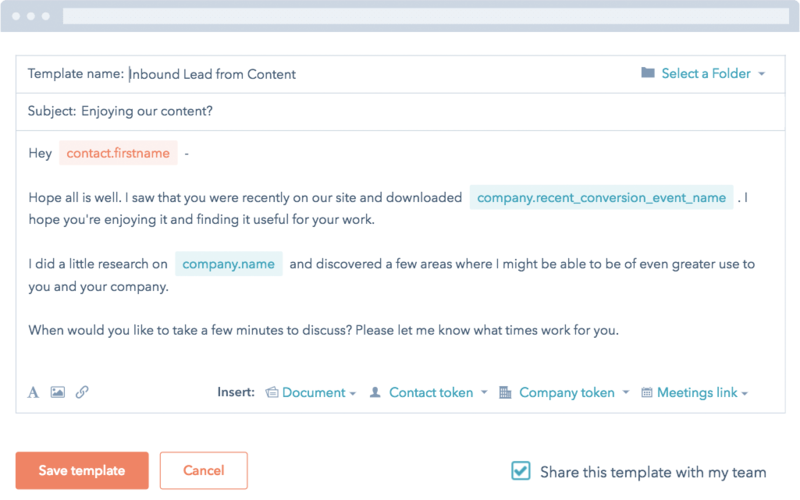 Reconnect with leads and remind them about an offer in a very personal way using automation. Click here to read 4 steps to grow your startup sales. Without a process your CRM will not help you with anything that makes it advantageous to use one. Carefully think through the activities your business carries out and how that will map to your CRM so you can drive the tool and the tool doesn't drive you. There are many advantages to move away from dated ways of working and ensuring that your tools and technology grow with you as your business does. While you get up-to-speed with the sales and marketing jargon of the startup world, no amount of effort is worth it if you can't measure ROI - having 100k instagram followers means nothing if that doesn't translate to revenue. A CRM can help you attach a deal to a contact or company making that relationship or any effort spent on it, measurable toward its contribution to a pipeline. Having all your contacts in one system will drive efficiency and take away the difficulty of going through all the data that's been collected in a dispersed manner. Open excel --> Find Contact --> Add New Activity --> Add the timestamp --> Add Notes --> Add Follow-up tasks --> Add an owner --> Never ending! You're looking at long-winded way of managing your day-to-day activity with the contact making it hard for you and your team to keep up. Using a CRM system will help team collaboration and increase your ability to grow relationships. There's a lot of effort that goes in to maintaining a relationship and automating tasks can often help you stay on top of mind of your prospect. If you use Pipedrive, Zoho or others there's a review of CRM softwares available on the G2 Crowd website that you can take a look at. Here's how the CRM grid looks in 2018. 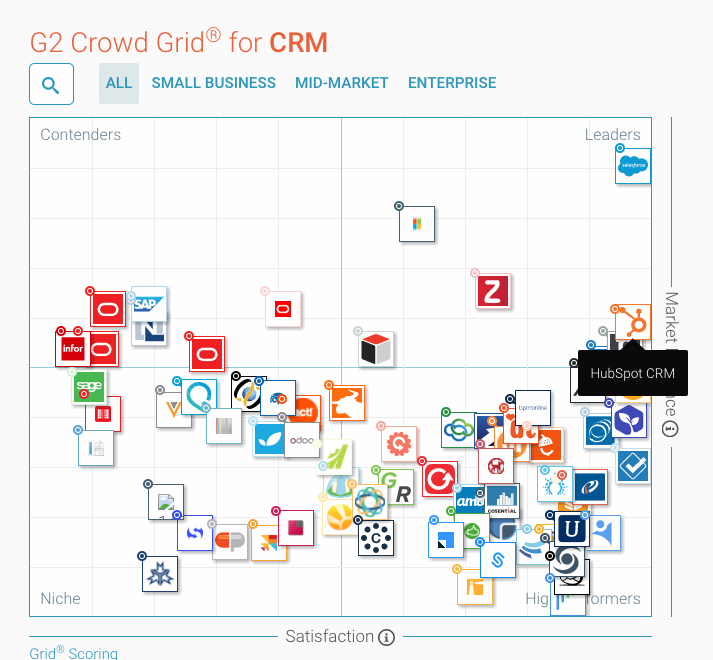 Products in the leader quadrant are rated highly by G2 Crowd users and have substantial Market Presence scores. It's not really about picking the best CRM system, it's about finding one that works for you and team. We recommend looking at pricing and th ease of use as top indicators of helping you choose the right CRM. As HubSpot Platinum Partners we want to ensure that small business and startups are aware of the options that are low cost/free and easy-to-use. Here are the options that some businesses have considered using and take a look at the comparison vs. the HubSpot CRM. So there you go, a lot to consider but totally worthwhile for your small business or Startup. No more information on your contacts getting dispersed across spreadsheets, notepads, sticky notes (on your already busy desktop too) and not to forget your memories. Our brains must be so heavy with all the things that we store in there! If you are a small business owner, we're running small group session for sales and marketing that we think you'd get a lot out of so you can have a great process that's supported by a CRM that works for your team. Join us!